The Byer of Maine Amazonas Easy Traveller Hammock is a lightweight, packable basic hammock—the backbone of any modular hammock camping system. The Byer of Maine Easy Traveller hammock is a basic, Brazilian-style gathered-end hammock made from lightweight parachute nylon fabric. The hammock is sewn from three panels of fabric—a common approach—with the large central panel flanked with two smaller colorful panels. The ends are gathered with a simple 5mm rope loop. The fabric used on the Byer of Maine hammocks has a lighter, softer hand than competing brands. It feels much more like real parachute fabric than what is commonly known as “parachute nylon,” which is really a thicker crinkle taffeta nylon. Byer of Maine upgraded the design on this new variation of the Traveller by widening the center panel and narrowing the side panels. This means there is more room in the center area to lie without having the seams behind your head and legs, resulting in increased comfort. I grew fond of the fabric used by Byer of Maine when I reviewed the Moskito Kakoon hammock. It is light, yet durable, and has a soft feel that I really like. 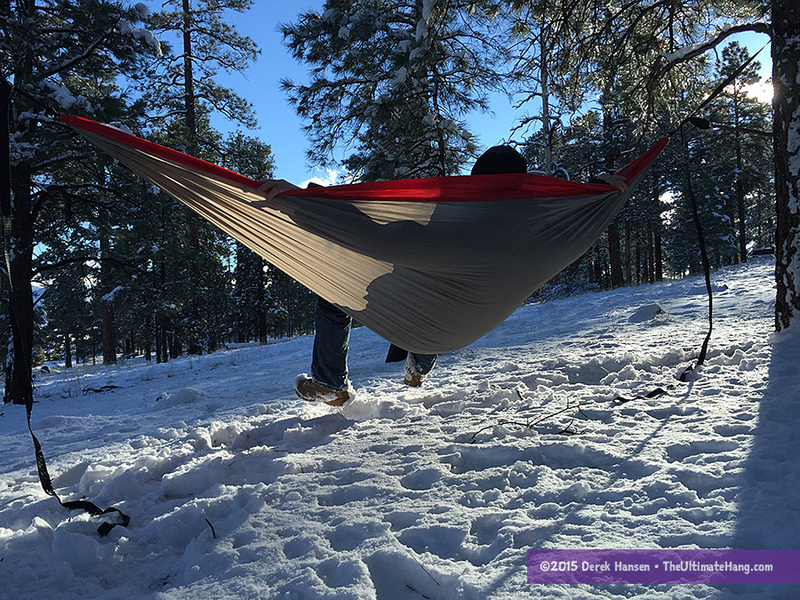 This style of hammock is the backbone of all sorts of hammock adventures, whether lounging at the park, taking a break at school, or going on a camping adventure. I often recommend that folks start off with a simple, inexpensive hammock like this to get a feel for lying and sleeping in a hammock before investing in a full-out camping hammock. What really makes this hammock stand out from the competition is the fabric. For its size, you get a much lighter hammock than other brands and it also packs down to grapefruit size. Another design difference with the Traveller is the continuous loop that gathers up the end channels. 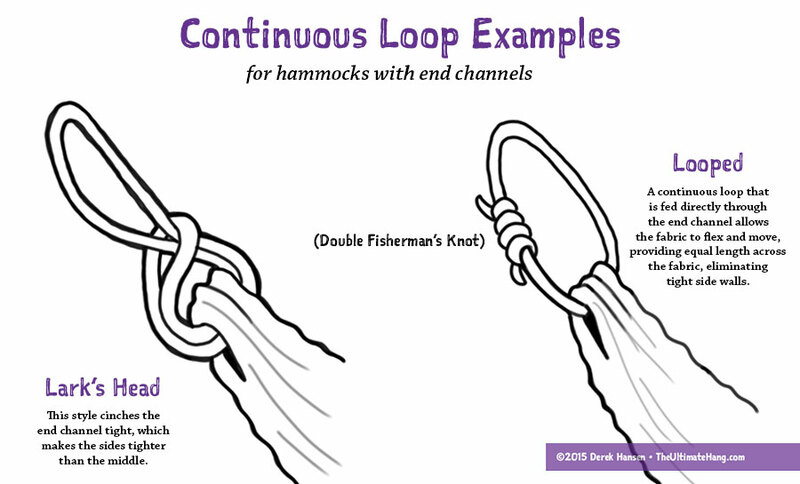 Most companies start with a rope loop that they feed through the end channel and then tie together using a Lark’s Head knot. This method cinches up the ends of the hammock and tightens the edges, resulting in a bucket seat hammock and makes it harder to lay diagonally. The Traveller, in contrast, feeds one end of a rope through the channel and then ties the two ends together, so the continuous loop is fed through the channel. This allows the sides of the hammock to flex and adapt better to the lay, thus reducing calf strain. It’s a technique I prefer on my hammocks and I often retrofit any gathered end hammock to use this method as I find it superior for comfort. The one downside to this hammock is the stuff sack. The only storage for this hammock is the packaging it came in, which has a patch of Tyvek® material covering the one half of the sack. The Tyvek really stiffens the sack, and with the pillowcase opening, it can be difficult at times to stuff into. The packaging/stuff sack is separate from the hammock itself. You can tie the stuff sack to the end loops, or even sew it on the hammock if you want. For me, I’d scrap the packaging and pick up a lightweight double-sided stuff sack that stays connected to the hammock and is a little easier to pack and deploy. The hammock is well-made with only a few visible errant strands of thread. All the seams are straight and tight. There aren’t many hammocks that have the same fabric as the Byer of Maine, but it is similar to several basic hammocks on the market.